Willie Nelson probably said it best: [our] heroes have always been cowboys. Back before the west was won, they brought traveling wild west shows east to entertain the masses. There were pulp fiction dime store novels about famous cowboys and the infamous outlaws they brought to justice. Then there were radio dramas, engaging anxious listeners every week with thrilling tales of yesteryear. Comic books and comic strips followed, as did weekly movie serials, which were a precursor of dozens of popular TV westerns. And, of course, feature-length movie westerns were a staple of American culture for decades. Even after their popularity waned, every so many years somebody would bring the western back, and cowboys and Indians would return, triumphantly, to the silver screen. One of the notable heroes on horseback who hasn’t lost his popularity is The Lone Ranger. So it’s no surprise this iconic masked man has made his way from radio to paperback novels to comics to television to movies over the years, the latest offering coming from Disney. The Lone Ranger is the ultimate good guy in a white hat on a white horse, and it’s particularly cool that his bullets are made out of silver. Why that’s so cool, I don’t really know, because it seems like those would be really expensive bullets. On the other hand, if he ever ran across a werewolf, at least he’d be ready, but now I’m mixing mythologies. So Armie Hammer plays John Reid, a freshly minted district attorney whose older, tougher brother Dan (James Badge Dale) is a Texas Ranger. Dan and seven other Texas Rangers are in pursuit of a nasty outlaw named Butch Cavendish, played repulsively well by William Fichtner. There’s an innocent but complicated love triangle between the brothers and Dan’s wife Rebecca (Ruth Wilson), which motivates Dan to deputize his younger brother as a Ranger before they ride off after the Cavendish gang. Unfortunately, the gang is waiting in a canyon and ambushes the Texas Rangers, killing them all in a flurry of bullets. Dan nearly escapes, but is shot down trying to save his brother. John, barely alive but apparently dead, sees Cavendish finish off his brother in a brutal fashion before he himself passes out. When John awakens, he finds he has been saved by an outcast Comanche named Tonto, with some assistance from a rather strange, white horse. Tonto (played with amusing, stoic quirkiness by Johnny Depp), had already dug the graves for the fallen Rangers, including John, when the horse intervened. Tonto fashioned a mask from Dan’s black leather vest, eyeholes cut by the very bullets that cut him down. He convinces John to wear the mask and the silver star because it will strike fear into the hearts of the outlaws if they believe one of the massacred Texas Rangers has come back to life. Tonto, as it turns out, is also in pursuit of Butch Cavendish, but for his own reasons. So the unlikely duo set out together, along with a yet-unnamed white horse, to bring the murderous outlaws to justice. What follows is two-and-a-half hours of action-filled fun. This is not a western like Dances with Wolves, or The Searchers, or Unforgiven. Nor does it pretend to be. What it aspires to is precisely what Raiders of the Lost Ark did so phenomenally well so many years ago, namely to put a modern spin on the exciting chapter serials (or cliffhangers) of the 1930s and 1940s. So many of the original serials had weak plots and weaker budgets, but they made up for it with enthusiasm and adrenaline and action. And this was before television, so people returned to the theater every Saturday to find out how their heroes had escaped from whatever peril they found themselves in last week, only to inevitably end up at the end of their rope yet again after this week’s run-in with the bad guys! The Lone Ranger captures all the cliffhanging excitement of the old, low-budget, black-and-white serials, but with the benefit of spectacular advances in cameras and special effects, not to mention a budget roughly the size of Rhode Island. 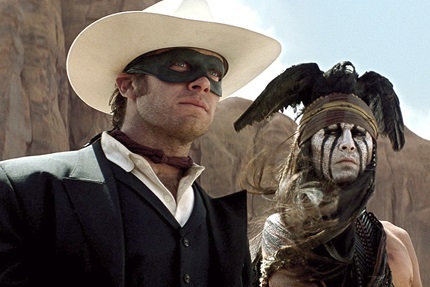 It also improves on the Indian sidekick bit, since Tonto is, appropriately, The Lone Ranger’s equal. In fact, the movie could’ve easily been called Tonto, but that might’ve confused a few people, so they stuck with what works. In any case, this is the story of The Lone Ranger and Tonto, and the chemistry between Hammer and Depp is enjoyable from start to finish. The landscape of the film is familiar to anyone who’s ever seen a John Ford western, although the bad guys might seem more like they escaped from a Sergio Leone spaghetti western. Rossini’s familiar William Tell Overture does, finally, make an audible appearance in the movie, although not until you really start to notice it isn’t there. Overall, The Lone Ranger is pretty family-friendly fare, notwithstanding the fair amount of gun slinging that goes on throughout the film. Some of the action is a bit over-the-top, but it’s all fun, and parts of it are downright funny. This isn’t a deep movie with profound undertones about complex moral issues; this is a good, old-fashioned western wrapped in a buddy movie. I enjoyed it, as did the rest of the folks in the theater with my wife and me, and I’ll enjoy it again when it comes out on Blu-ray. Yes, my heroes have always been cowboys. And they still are, it seems.